· The Suri Alpaca is a member of the camelid family, which also includes the llama, Huacaya alpaca, the wild vicuna, guanaco, and the camel. The Suri dates back between 5 to 20 thousand years and is known from archaeological records to have been domesticated for 6,000 years. · The Suri Alpaca is distinguished in the Camelid family by its unique fiber characteristics. The fiber grows parallel to the body while hanging in long, separate, distinctive locks, its artistic style enhances the graceful appearance of the animal compared to the soft, woolly look of the Huacaya alpaca. Suri fiber locks, made up of high luster fibers, drape down the sides of the body in a twisted or flat form of various sizes. · Suri is a high end, luxury fiber prized for its combination of luster, fineness, slick handle, cool feeling, drape, elegance, and strength. No other animal fiber possesses all of these features, and it makes Suri very highly sought after throughout the world. Suri can be used in a multitude of applications including knitting and weaving, as its elegance and beauty transcend the processing medium. The first Suris were imported to the U.S. from Bolivia in the winter of 1991. Subsequent imports came in 1993, 1995, 1996 and 1998 from Peru, Chile and Bolivia. In 1998, the general membership of ARI (The Alpaca Registry Inc.) voted to close the registry to importations. By closing ARI to further importations, the future market of alpaca breeding is protected from premature market saturation. At such time the general membership decides that more genetic diversity is necessary, they may vote to re-open the registry to select groups of alpaca importations. · Alpacas are members of the Camelid family, which also includes camels and llamas. Unlike the llama and camel, which are used primarily as pack animals, the alpaca is raised for its fiber. There are two breeds of alpaca which are Suri and Huacaya. · In the United States, alpacas are raised as breeding stock and for their luxurious fiber. They are sheared annually in the spring allowing them to be cooler during the summer months. The fiber is then processed into yarn, as well as knitted and woven garments. · Alpaca fiber is generally classed with luxury fibers like cashmere, mohair and angora, both because of its fineness and its relative scarcity. It comes in 22 natural colors which is more than any other fiber-producing animal. This luxuriously soft hollow fiber is lighter, softer, warmer and more durable than sheep's wool. It is highly sought-after around the world for fine knitted and woven clothing and blankets. · Alpacas are gentle, intelligent, curious, timid and quiet animals, who vocalize with a humming sound. They are herd animals and need at least one other alpaca for company, but prefer "the more the merrier." 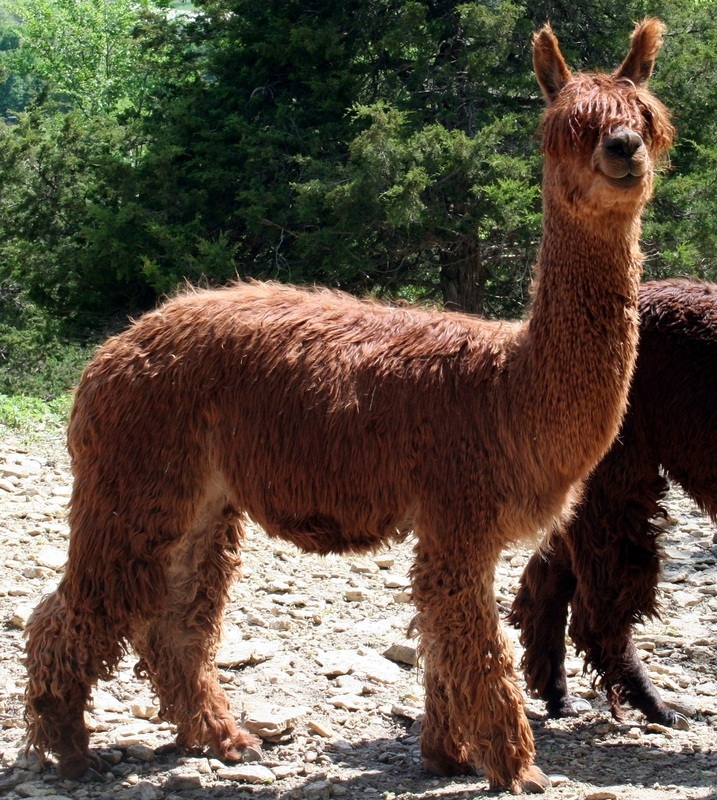 · Alpacas weigh between 130 to 200 lbs. and have a lifespan of approximately 15 to 20 years. Their gestation period is 11 to 11.5 months. A single baby or "cria" is usually born early morning through daylight hours, with a birth weight between 14-22 lbs. · Health maintenance consists of annual immunizations, periodic deworming, toenail trimming and annual shearing. · Since the alpaca industry is relatively new to the U.S., early alpaca breeders had the foresight to create a basic condition for maintaining the value of their bloodstock, namely a breed registry. The Alpaca Registry Inc. (ARI) is a state of the art system, created to accurately document bloodlines and provide pedigree information to alpaca breeders. Virtually all alpacas in the United States are registered with ARI. Each animal is DNA tested to verify parentage prior to registration. Alpacas cannot be registered with ARI unless both sire and dam are ARI registered animals. · Alpaca's feet are padded and they leave even the most delicate terrain undamaged as it browses on native grasses. · The alpaca is a modified ruminant with a three-compartment stomach, converting grass and hay to energy very efficiently, eating less than other farm animals. · Alpacas do not usually eat or destroy trees, preferring to nibble on tender grasses, which they do not pull up by the roots. · Alpaca dung (commonly referred to as "beans") once composted, makes a rich fertilizer which gardeners find perfect for growing fruits and vegetables. · A herd of alpacas consolidates its "beans" in one or two spots in the pasture, thereby controlling the spread of parasites, and making it easy to collect and compost for fertilizer. · Each alpaca produces enough fleece per year to create several soft, warm sweaters. · Harsh or toxic chemicals are not necessary in the production of their natural fiber products due to the fact that their fleece contains no lanolin and is naturally hypoallergenic. · Alpaca fiber comes in 22 beautiful, natural colors, it can be dyed and may even be dyed using only natural plant dyes.